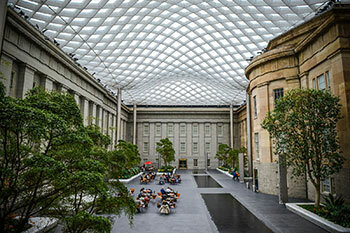 The Portrait Gallery shares a building—named the Donald W. Reynolds Center for American Art and Portraiture—with the Smithsonian American Art Museum. Our landmark Greek Revival building—one of the oldest federal structures in the city—is beloved by Washingtonians. There are entrances at F and G Streets. Visitors may enter the museum from either entrance. 11:45 a.m., 1:30, 3:15, and 4:30 p.m.
Tours are subject to availability; last-minute cancellations may occur. Please check our events calendar. 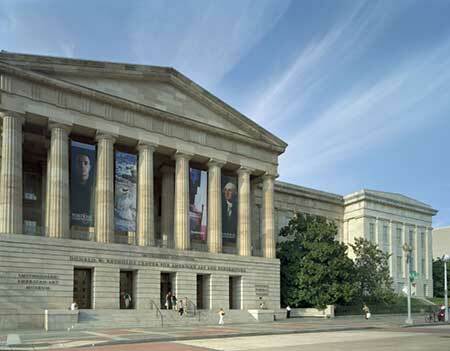 The Portrait Gallery is accessible to all visitors, and we are committed to those with special needs.